Find this adorable booklet here. Next Wednesday, April 22, is Earth Day—a day on which people around the world renew their commitment to our Earth’s environment. What began in the United States 45 years ago as a day of environmental teaching and awareness is now celebrated in classrooms around the globe. Very nifty, indeed! If you haven’t yet selected your Earth Day activities, scroll through the more than 250 free offerings at The Mailbox. You’ll find craft projects, songs, science activities, skill pages, and more! 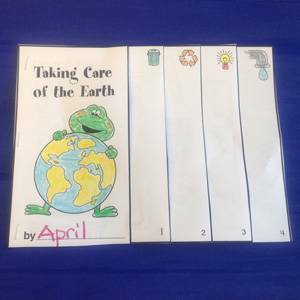 And be sure to check out our “Taking Care of the Earth” Pinterest board too. Now for a few “can” you believe these facts! • Aluminum is the most valuable material in recycling bins. • Recycling one aluminum can saves enough energy to listen to an entire album on an iPod. • Recycling one aluminum can saves enough energy to run a television for three hours. • There is no limit to the number of times aluminum cans can be recycled. • Aluminum cans that are not recycled can take 200–500 years to fully decompose in a landfill.